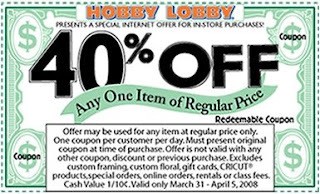 Bargain Shopping Paradise: DEAL ALERT: Hobby Lobby's weekly specials, PLUS 40% off coupon! DEAL ALERT: Hobby Lobby's weekly specials, PLUS 40% off coupon! Hobby Lobby's weekly sale flyer can afford many, many savings . . . a crafty bargain shopping utopia of savings, in fact! You can view this week's e-flyer, by clicking HERE, where they list savings like 50% off photo frames, 50% off decorative crosses, 50% off flowering and greenery bushes, and more. They also include a 40% off coupon for any regularly priced item. In fact, they have a coupon included EVERY WEEK! For those of you who like home decorating, consider yourselves crafty, or have a hobby like painting or sewing of some kind, this savings can be significant! Here's this week's coupon . . . click on the image to print. Coupon expires April 5, 2008. And if you want to stay in the loop on their weekly specials, subscribe here .